By the division of Macedonia, the Romans created an opportunity of easier taking part in the inside things in Macedonia and creating hits between separately areas. Anti-Roman temper could be felt everywhere in the territory of Macedonia. The opportunity came and Andrisk - the fake Philip started an uprising against the Roman authority in Macedonia. When Andrisk came in Macedonia, this man from unknown origin, maybe from Asia, represented himself as Philip - son of Perseius, who actually died when he had 18 years. Andrisk got on his side the poor population of Macedonia, to collect an army and temporary to take the authority in his hands. This movement which is called the uprising of Andrisk in 149 BC, was supported by the Thracians. The territory of the uprising got large and made seriously damage to the Romans. But by the help of surrenders who pretreated the rebels and got on Roman side the uprising was destroyed by the powerful Roman army. The consequences of this big loss for Macedonia were extremely bad: in 148 BC Macedonia became typical Roman province and as a province lost the temporary independence. 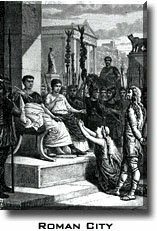 A Roman man was put for a ruler of this province, which authority was only for killing people and exploitation of the Macedonian population. Macedonia as a Roman province on the Balkan Peninsula, was used as a base for the military operations of the Roman army in Asia and Africa.